Classic Toy Train Set Just $26.74! Down From $70! PLUS FREE Shipping! You are here: Home / Great Deals / Amazon Deals / Classic Toy Train Set Just $26.74! Down From $70! PLUS FREE Shipping! Amazon is currently offering this Classic Toy Train Set for just $26.74 down from $69.99 PLUS FREE shipping! The MOTA Classic Toy Train Set is a one-of-a-kind toy train that will bring hours of fun to your family. This classic toy train is a battery-powered locomotive that blows real smoke, makes authentic sounds, and lugs cargo carts around an easy-to-build train track. Included with the package is a set of train tracks that easily snap together, making the assembly a walk in the park. 2 to 3 drops of mineral oil (sold separately) down the top of the smoke stack required for smoke. 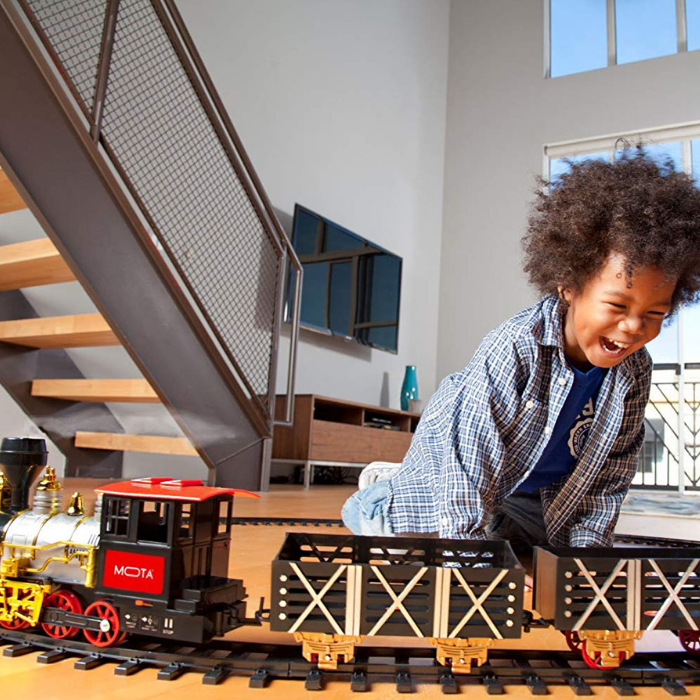 The MOTA Toy Train Set is the perfect gift for the entire family, friend and hobbyist. Assemble this train around the base of your favorite Christmas tree to add that extra holiday joy to any home. You can also have it setup as a beautiful decoration in your room, table, or floor space. This toy train set will keep friends, family, loved-ones, and guests entertained. For ages 8 and up.